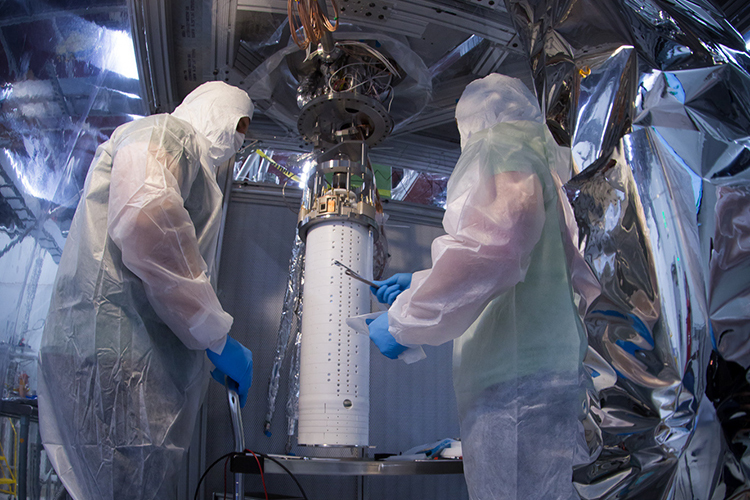 A new dark matter detector, which will be at least 100 times more sensitive than its predecessor, has cleared another approval milestone and is on schedule to begin its deep-underground hunt for theoretical particles known as WIMPs, or weakly interacting massive particles, in 2020. WIMPs are among the top prospects for explaining dark matter, the unseen stuff that scientists have observed only through gravitational effects. The detector, called LUX-ZEPLIN, or LZ, recently received an important U.S. Department of Energy approval, which sets in motion the buildout of major components and the preparation of its nearly mile-deep lair in South Dakota. LZ is the next-generation of the Large Underground Xenon dark matter experiment, or LUX, which operated beneath a mile of rock at the Sanford Underground Research Facility (SURF) in a former gold mine in the Black Hills of South Dakota. “A major reason for LZ is surprises: We’re really pushing way into the low-energy, low-background parameter space where no one has ever looked, and this is where surprises could await. That’s where new things get discovered,” said Dan McKinsey, a UC Berkeley professor in the Department of Physics and Lawrence Berkeley National Laboratory (Berkeley Lab) faculty senior scientist who is a part of the LZ collaboration.